I guess if I were somewhat vain I might consider the dangerous middle my ever expanding stomach. It seems to me that cruising should be where we lose those additional pounds with all that hard work and sacrifice. However, it seems to be the opposite. Guess I’m not working hard enough or maybe I’m enjoying the lifestyle a little too much. No, my dangerous middle just keeps expanding to suit the moment – but, it’s not my dangerous middle I’m talking about here rather the dangerous middle section of the Pacific Ocean joining Bora Bora and the Kingdom of Tonga. The other aspect of sailing in this zone is by the time you have reached it you’ve become accustomed to trusting the GRIB files that you religiously download every day, but you quickly discover that the accuracy of GRIBs go out the window rapidly in this area. One of the problems is that GRIBs can’t handle the data that is input from around fronts and troughs. So, with no satisfactory data to report they print these little circles which to the casual observer look like areas of no wind. There is, however, a big difference between an area of no wind and an area of insufficient data ………and that’s where you can get caught. 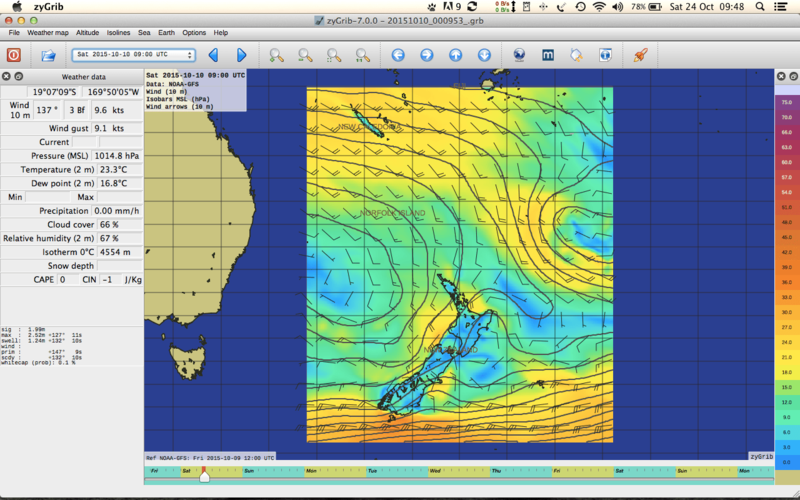 Niue in the top right with the GRIB telling us 10 knots. And so late on Saturday the 10th of October armed with our well intentioned GRIB files we set out from Niue heading for the Kingdom of Tonga and in particular the Vava’u group. According to our GRIBs the wind would be around 15knots with gusts to 20, all in all it should have been a pleasant 2 day sail. Yeah, right! As we left late in the day we had a reef in the main which will take us comfortably to around 24 knots and with the current sea state felt that it would be a reasonable night……yeah right! As the night progressed so did the wind and sea state, so late in the evening in went the second reef and reef in the genoa and we sailed along merrily with boat speeds in the 11 knot range with the occasional 13 with a little help from the sea state. 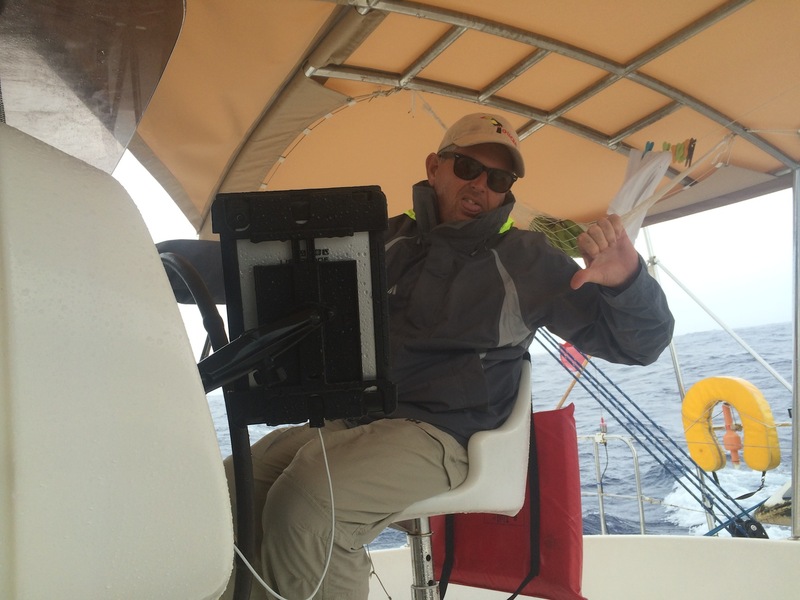 During the next day the wind continued to build and we continued to reef, the genoa now with only a hanky out the front of the boat and speeds continued along the same lines. 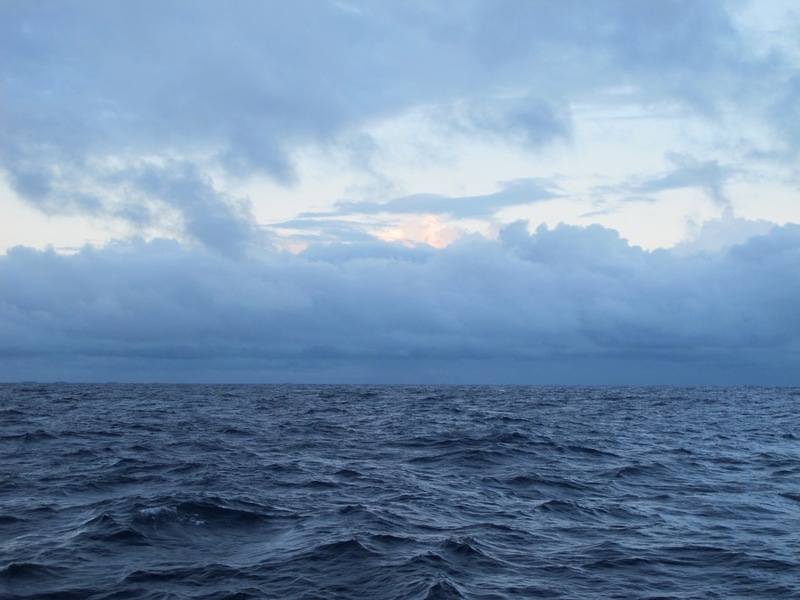 The sea state however was becoming unpleasant with very large cross swells shifting the boat about and at one point a very large cross swell picked up the port stern of the boat and nicely deposited it 90 degrees closer to windward. As the evening progressed so did our wind now blowing 25-28 knots gusting 30 so again we hunkered down for another night of rough conditions. Thumbs down to the cold weather. The wind and cross swells we could put up with but the straw that broke the camel’s back so as to speak was the rain- and not just normal rain but squally rain coming in horizontal sheets. Not so bad if your cockpit has clears and can be enclosed but not us – when you’re out there you’re out there and all that was left was to gather the soap and catch up on the weekly bath. Our timing was to arrive around 06:00am and then quietly motor to the main dock and await customs clearance. But even with our efforts to slow the boat down we arrived on …..oh god we crossed the dateline – now what day is it, oh that’s right Tuesday morning at 01:30am, just a little early. 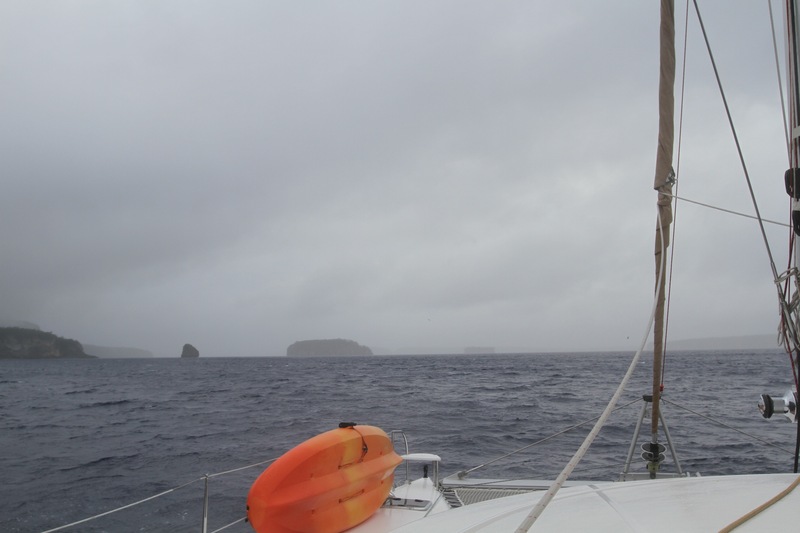 Now we had the not so nice task of cruising up and down the west coast of the island in pitch black conditions with blinding rain, trying to avoid Rehua who had arrived 2 hours earlier and were in the same holding pattern as us. After a number of exhausting hours glued to the AIS and squinting through the rain storms, dawn finally arrived and with it a smidgeon of visibility, with low cloud and mist swirling around the cliffs surrounding Neiafu harbour. Finally we had arrived …bloody GRIB’s! 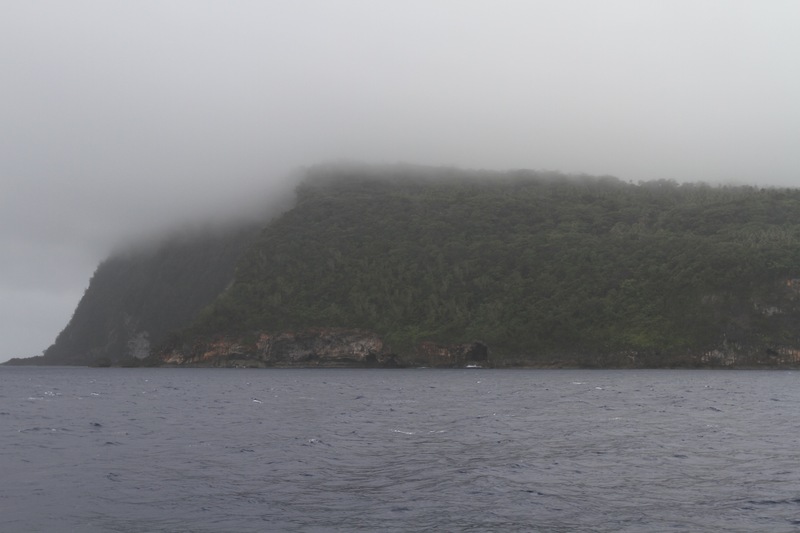 The cliffs of Tonga – play misty for me. Approaching the entrance to Neiafu harbour. 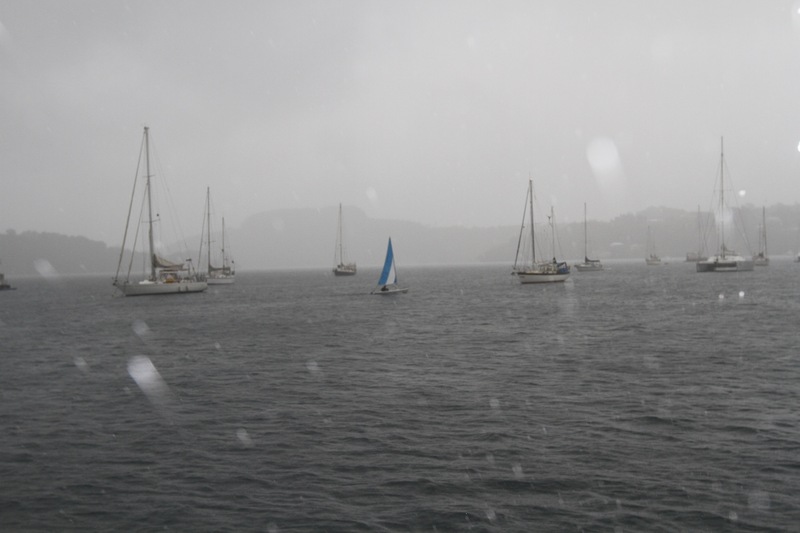 Jolly…..Neiafu harbour in the rain. Hi Sue, thanks for the support! yes, I like the ‘curdled milk run” analogy! We’re planning to head to NZ anytime after mid-Nov. A lot of boats have gone already but I think it’s a bit early, likely to encounter too many equinoctial gales in spring off the NZ coast. So we’ll hang out here in Tonga for a few more weeks and then try and pick our weather window…but it’s a bit of a lottery out here!